Hazarat Shahwilayat was the son of Mira Ali Buzurg who was a learned scholar. His mother’s name was ‘Umme Habeeba’ and she was the daughter of Syed Abdul Moueed Ali. The parents of Shahwilayat were direct descendents of Imam Ali al-Naqi al-Hadi (AS) – the 10 th Imam. He was born in Wasit in present-day Iraq and migrated to what is now Amroha in Uttar Pradesh, India. In 662 AH, to avoid the persecution and tyranny of ruler they decided to leave their ancestral lands for the good and migrated to Bhakkar in Multan (now in Pakistan). Boy Sharfuddin received his primary education Dars-e-Quarn and Hadith at home and his father was his mentor and tutor. As grown-up he was trained in spiritual disciplines by Syed Jalauddin, Syed Bahuddin – the father-in-law of Syed Jalauddin and Moulana Nasehuddin Suharwardi s / o Qazi Hameeduddin Nagori. The names of Saint Arif Suharwardi and Syed Usman Lal Shahbaz Qalander aka Jhulewala are included in the list of his teachers. He was assigned the area between River Ganges and Kumayun Hills as his preaching spiritual domain by his spiritual guides. He followed the simple ascetic life and his message was universal love and respect. He was admired and received warmly by the people of all the faiths. The fame of his piety and erudition spread in all the four corners around Amroha. There is no authentic record how long Hazrat Sharfuddin stayed in Amroha and then left for Kumyun Hills for meditation and prayers. His trip to Hills was meant to acquire knowledge and practice Riyazat, Chillakashi and special prayers. It was a sort of specialized spiritual training in splendid isolation. For this reason alone he was also called as PEER PAHARI – The Saint of Hills. He had also performed Haj and stayed in Mecca for 7 years. No dated of departure or arrival for Haj are available. He died on 21 Rajab 739 AH and was buried in Amroha. Syed Mohammed Abdal Dooda Dhari, a close relative of Shahwilayat was one of his appointed subordinate but Syed Sharafuddin instructed to discontinue the practice of baiyat and the system of succession was discarded forever in his lineage. 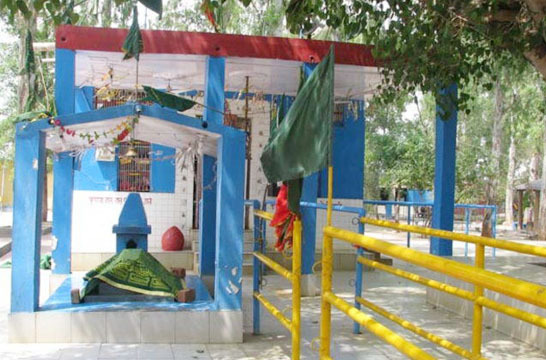 Dooda Dhari Saheb died in 798 AH and all the sacred belongings of Hazrat Sharfuddin were buried with him. First Urdu poet of north India, Ismaeel Amrohvi and Meer Saadat Ali Saadat Amrohvi, the mentor of Mer Taqi Meer, the most distinguished Urdu poet were also the descendants of Syed Hussain Sharfuddin Shah Wilayat Naqvi. Local legend says that the animals that live in his mazar (shrine), especially scorpions, never harm humans.